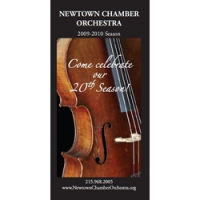 The Newtown Chamber Orchestra is a highly acclaimed ensemble performing both period and contemporary chamber works. Its mission is dedicated to educating audiences to classical and modern chamber music, promoting new chamber works by contemporary composers, and encouraging young musicians of the community. The all-professional orchestra premiers commissioned works, hosts an annual Young Musicians Competition, and features solo performances by local as well as internationally known artists. Please visit our website for upcoming performances.